The benchmarking expert P3 and connect magazine have been testing the Spanish mobile networks since 2015. This year, we have conducted our authoritative benchmark for the fourth time, further enhancing its methodology. The results reveal some surprises:Two of the examined operators hold their position, while the two others were able to improve con­siderably. This also leads to a change in the overall ranking compared to last year‘s results. Vodafone has won the P3 connect Mobile Benchmark Spain the fourth time in a row, with Orange and Movistar constantly competing for the second rank, and Yoigo steadily working on improvements. These overall trends are still true for 2018. P3‘s network benchmarks are widely accepted as the de-facto industry standard being highly objective. The carefully designed methodology of our 2018 benchmark in Spain combines drivetests and walktests for executing detailed voice and data measurements under controlled circumstances with a sophisti­cated crowdsour­cing approach. This provides profound insights into the overall coverage of voice, data and 4G services, real-world User Down­load Speeds and Data Service Availability. P3‘s holistic approach to network bench­marking includes both drivetest and walktest mea­surements as well as crowdsourcing. The drive- and walktests allow for evaluating the cutting edge of the networks‘ capabi­lities. Crowdsourcing unveils the service quality and performance actually experienced by the users. We have thoroughly weighted these components in order to give a realistic and authoritative assessment of the rated networks‘ true potential and performance. As in the three previous years, the overall winner is Vodafone. On the second rank, Orange manages to overtake Movistar thanks to distinct improvements particularly in its voice results. Movistar still shows a strong performance especially in the data category, but in the overall assessment only achieves the third rank this time. The smallest operator in Spain, Yoigo, has con­siderably improved compared to its results in the previous years. This is true in the data and also especially in the voice category. In a direct comparison to last year‘s results, Vodafone overall kept the same performance while Movistar dropped slightly. In the additional crowdsourced assessmentwhich contributes 15 per cent to the total result this year, Orange takes the overall lead, scoring slightly ahead of Movistar. 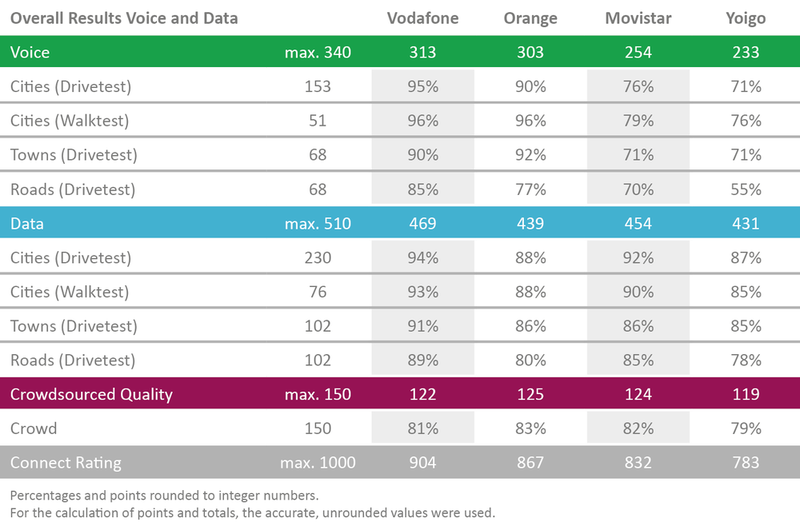 Vodafone achieves the best score for User Download Speed, Orange and Movistar are on par. How­ever, all operators show some room for improve­ment. Yoigo‘s improve­ments are also reflected in a decent crowd score. The Data Service Availability is excellent in all four Spanish networks. Vodafone keeps its performance, Orange and Yoigo improved their scores considerably. Movistar lost a couple of points but still achieves good results. The three largest Spanish mobile network operators permanently compete for subscriber numbers and market share. Recently, Orange managed to surpass Vodafone in these key figures. Also, all four Spanish operators have constantly increased their LTE coverage and speeds. Movistar is the brand name the Spanish telecom­muni­­cations company Telefónica causes for the mobile network in its home market. Tele­­fónica S.A. itself is one of the largest telco companies in the world. The operator is active in 17 countries with a total of 122,700 em­ployees and achieved worldwide revenues of over €52 billion in its fiscal year 2017. While the company intro­duced the Movistar brand in Latin American countries in 2005, it has been active in Spain since the launch of GSM services back in 1995. Today, Movi­star is the largest mobile operator in Spain with about 17.6 million subscribers, which equals a market share of roughly 33 per cent. It offers GSM service at 900 and 1800 MHz, UMTS/ 3G at 900 and 2100 MHz and LTE at 800, 1800 and 2600 MHz. Since the end of 2014, Movistar has supported 4G+ carrier aggregation with maximum speeds rea­ching today up to 375 Mbps. The operator claims to provide 4G coverage to approximatley 95 per cent of the Spanish population. Orange España is the brand name of France Telecom‘s mobile network in Spain. It has been operating under this name since 2006. Previously, the network was known as “Amena“ – this brand name lives on in Orange Spain‘s portfolio as a low-cost offer that is only available on the internet. Also, its network serves a number of mobile virtual network operators such as MasMovil, Carrefour Móvil and others. With 15.9 million custo­mers, Orange is the second largest Spanish mobile operator with a market share of about 30 per cent. In the fiscal year 2017, Orange Spain achieved arevenue of €5.3 billion which contributed 13 per cent to the whole Orange Group‘s results.Orange Spain has deployed 2G networks at 900 and 1800 MHz, 3G networks at 900 and 2100 MHz and 4G at 800, 1800 and 2600 MHz. The operator claims that its 4G network reaches more than 96 per cent of the Spanish population. Also, Orange was the first Spanish operator to offer VoLTE to its 4G customers. Vodafone España has been present on the Spanish mobile communications market since the year 2000. Then, the British Vodafone Group acquired Airtel Móviles which had operated in Spain since 1994. In Spain, Vodafone reports 14.1 million mo­bile customers, adding up to a market share of about 26 per cent and making Vodafone the third largest operator in the country following at close distance behind its competitor Orange. In the fiscal year 2017/2018, Vodafone Spain achieved revenues of €4.5 billion which contri­butes about eleven per cent to the whole Vodafone Group‘s finan­cial results. Vodafone‘s mobile network in Spain offers GSM service at 900 and 1800 MHz, UMTS/3G at 900 and 2100 MHz and LTE at 800, 1800, 2100 and 2600 MHz. The Vodafone 4G network in Spain supports LTE carrier aggregation (“4G+“) with maximum down­link speeds of 300 Mbps. Vodafone España claims to offer the best LTE coverage in Spain, in 2017 reaching approximately 97 per cent of the Spanish population, and is now also offering VoLTE. Yoigo was the latest mobile operator to enter the Spanish market. Founded in 2000 under the name Xfera, the company started its actual operation in 2006, offering only a UMTS/3G network at 2100 MHz. At this time, the Swedish telecommunications company TeliaSonera acquired the majority of shares and rebranded the network as “Yoigo“. In June 2016, the former MVNO (mobile virtual network operator) Másmóvil bought the company. For its fiscal year 2017, Másmóvil reported revenues in Spain of €1.3 billion. Yoigo had a national roaming agreement with Movistar until the end of 2016. Since January 2017, Yoigo customers freely roam in the 2G and 3G networks of Orange at locations without Yoigo coverage. Yoigo claims a mobile customer base of 5.0 million mobile subscribers, which equals a market share of 11 per cent. Today, Yoigo operates 3G at 2100 MHz as well as 4G at 1800 MHz. The operator currently claims a LTE coverage of approximately 89 per cent of the Spanish population. P3‘s network bench­marks are widely accepted as a completely objective authority. In 2018, we conduct the P3 connect Mobile BenchmarkSpain for the fourth time, further enhancing its methodology. P3, based in Aachen, Germany, is a world leader in mobile network testing. The company has over 3,700 employees world­wide and a turnover of more than 370 mil­lion Euros. P3 is partnering with the international telecommunications magazine connect, which has 25 years of editorial expertise and is one of the leading test authorities in Europe for telecommunications products and services. Together, P3 and connect have been conducting the most impor­tant network benchmark test in Germany for more than 15 years, extending it to other European countries since 2009. In 2017 alone, P3 compiled approximately 60,000 measurement hours in more than 80 countries across five continents, with its test cars covering almost one million kilometres. As the de-facto industry standard, P3‘s benchmarking methodology focuses on customer-perceived network quality. The 2018 P3 connect Mobile Benchmark Spain consists of drivetests and walktests conducted throughout September 2018. Four drive test cars together covered about 12,400 kilometres. The test areas account for more than 12 million people, or roughly 25.8 per cent of the total popula­tion of Spain. In addition, the results of extensive crowdsourcing analyses considering July, August and September (Data Service Availa­bility: May to September) 2018 are included in the score.